Salmon is a highly nutritious fish that can be cooked in many different ways. 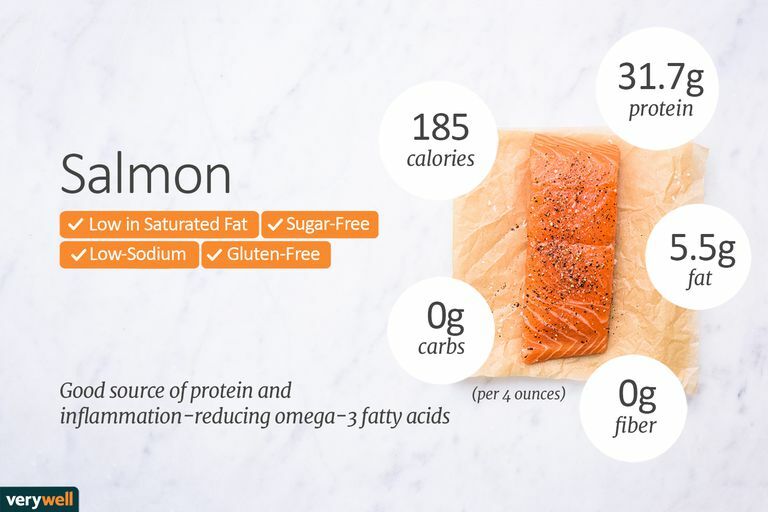 Unlike other varieties of fish, salmon doesn't dry out as easily likely due to its fat content—but don't worry, since these fats are heart-healthy. Salmon can be purchased fresh, frozen, smoked, and canned. If you worry about consuming fish due to high mercury content, fear not when it comes to salmon. Wild salmon can be eaten without fear of excess contaminants or mercury, and is extremely nutrient dense, including the highly-prized omega-3 fatty acids. The omega-3 fatty acids found in salmon are valuable for many reasons. Research indicates that diets rich in omega-3 fatty acids can decrease the risk of heart disease by reducing inflammation. Also, the tryptophan found in salmon is a precursor to seratonin, which can help manage depression and, because salmon is a good source of vitamin D, ingesting it may also help to improve mood, protect against macular degeneration, and aid in bone health. Salmon is high in protein and unsaturated fats (omega-3 fatty acids). It also contains virtually zero carbohydrates, which is great for people with diabetes. A 4-oz serving of wild salmon provides a full day’s requirement of vitamin D, making it one of the few foods that can make that claim. The same serving of fish contains over half of the necessary B12, niacin, and selenium, and is an excellent source of B6 and magnesium. Canned salmon also contains large amounts of calcium (due to the bones of the fish). The American Heart Association says, "eating fish twice per week is a great way to improve your heart health." People who eat fish regularly seem to be protected from a host of conditions, probably due to the omega-3 fats. Omega-3 fats reduce inflammation in our bodies. Inflammation is the base of many health problems, including heart disease, diabetes, some types of cancers and arthritis. Omega-3’s also help prevent the blood clots which cause many strokes. Some research also suggests that omega-3 fats have potential to help slow cognitive problems such as Alzheimer’s disease and age-related cognitive decline. Having the right ratio of omega-6 fatty acids (found in plant oils, nuts, and seeds) to omega-3 fatty acids is important. In those with the right ratio, there seems to be less depression and suicide risk, as well as less aggression—in one study, giving prison inmates this type of fat (plus vitamins) reduced aggressive behavior by a third in a mere two weeks. Common Questions About Salmon: Should You Choose Wild vs. Farmed? There is a controversy about eating wild vs. farmed salmon. Many people fear farm raised salmon for a variety of reasons. While many farms are taking measures to be more sustainable, eating farm raised salmon can be problematic for several reasons. Contamination: Much of the salmon available for human consumption today is farmed. By definition, farm raised means that the fish are raised in tanks or enclosures in the ocean, specifically for consumption. By contrast, wild-caught fish are caught using nets, hand-lines, divers, or traps in the "wild." People started to farm-raise salmon due its popularity and demand to have it year-round. Several independent studies have found concentrations of PCBs and other contaminants at levels of up to 10 times higher in farmed salmon. In Europe, there have even been situations where farmed fished tested at high levels of heavy metals such as lead and cadmium. These contaminants likely get to the fish through the feed, which becomes concentrated in the oil of the salmon.In addition, some farm raised fish are given artificial coloring for appearance and antibiotics to prevent disease. Because farm raised fish are raised in close proximity to each other, they are at greater risk or disease and fish lice, hence the reason for the antibiotics. Omega-3’s: Farmed fish is fattier due to their feed and lack of activity. But, that does not mean that they have more quality or quantity of omega-3 fatty acids. Farm raised fish are fed pellets that are made of ingredients such as soybean and wheat. Wild fish feed on foods that are richer in omega-3's, such as plankton. But there’s good news: Both wild and farmed salmon have lower levels of mercury than bigger fish, such as tuna. Also, methods are being taken to avoid overfishing, especially salmon from Alaska, where they carefully manage the fisheries. In addition, more farms are becoming more sustainable and are trying to avoid using contaminants, such as antibiotics. Additional Note: Most canned salmon is wild. Salmon can be purchased fresh, frozen, smoked, or canned. There are also several varieties of salmon, including king (chinook), atlantic, sockeye, coho, pink and chum. King salmon is the most expensive kind, is wild, and has a rich, buttery flavor. Atlantic salmon is typically farm raised, but if you are looking for the best varieties, you can go to the Montery Bay Seafood Watch website to search for the best choice recommendations. Sockeye salmon appears as a deep, red color and sometimes has a gray skin. Coho typically freezes well. Pink salmon is usually the type found in cans and holds up well for making salmon cakes. And chum, a much rarer find, is typically used for grilling and smoking. When possible and cost isn't an issue, it's probably best to choose wild salmon. Fresh Fish: Aim to get your fresh fish as fresh as possible. If you are able to see the whole fish, look for clear eyes and clean red or pink gills. If you are able to smell the fish, it should not smell fishy, instead, it should have a pleasant smell, similar to the fragrant salty ocean breeze. If you are purchasing the fish already filleted or as steaks, the flesh of the fish should be a bright, vibrant shade of red, coral or bright pink color and should not be dull or too slimy. There should be no bruising on the fish and no browning. Frozen Fish: Frozen fish can be just as good as fresh. Vacuum packing methods boost the quality of frozen, fresh fish. Make sure the source is reliable. And keep in mind, most fresh, wild salmon has been frozen previously. Canned salmon: Is almost always wild, and almost always one of the pink-fleshed varieties. Canned salmon is rich in calcium because there are small edible bones in it. Smoked Salmon: Salmon can also be preserved by smoking it, where it is dry cured with salt, spiced and then smoked. Lox and nova salmon is often called smoked, but it really is cured in brine, and not smoked at all. Salmon is sturdy and holds up to a great variety of cooking styles and seasonings. Salmon can be prepared in a variety of ways, including grilling, baking, poaching, broiling, or pan-frying. To avoid adding lots of calories and fat, flavor your salmon with herbs, spices, and lemon. Cook salmon just until it flakes to prevent it from drying out. This is about 10 minutes for each inch of thickness (on the grill, 5 minutes per side). It does not have to be opaque all the way through to be cooked, waiting that long with likely result in a dry product. Sublette, ME, and Hibbeln, JR, et al. "Omega-3 polyunsaturated essential Fatty Acid status as a predictor of future suicide risk." American Journal of Psychiatry 163. (2006):1100-2. How Healthy Are Raw Oysters? Is Wild Caught Healthier Than Farmed Fish?